Leader of the National Freedom Front, MP Wimal Weerawansa, who is currently in remand, would only be allowed to take part in committee meetings such as the Committee on Public Accounts and sectoral oversight committees, only during days when Parliament is in session, Speaker Karu Jayasuriya informed the House yesterday. The Speaker was responding to MP Weerawansa, who himself raised the question in Parliament yesterday. 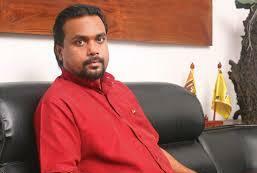 Weerawansa inquired as to whether he would be allowed to participate in meetings of committees of which he is a member. He asserted that he should be given the leeway to take part in all committee meetings, even on days when Parliament did not meet, as he believed it was his right as an MP.